I was wondering what the Guinness World Record, slinging, rules and regulations were. The record is 477 m set in 1992. I am not sure what the rules were. ??? I believe some of us (not me )on this forum can get real close if not break this record. I sling therefore I am. good point lion, seems kinda unfair to use a dart. So are there no rules on the length of the sling or the projectiles shape or weight ? i dont know but i can get a distance of 247 feet 5 in. with a small rock. with bigger rocks i can get a little further. and with my glands i can get alot further. I am trying to get a distance of 577 feet and 5 in. i used my stride to measure im not too shure thats right. seems a little short realy. i live in a maze of typo's&&&& popularity is for dolls a hero cannot be popular-Ralph Waldo Emerson&&&&DTB-master of the corny vest, and crappy carpet! 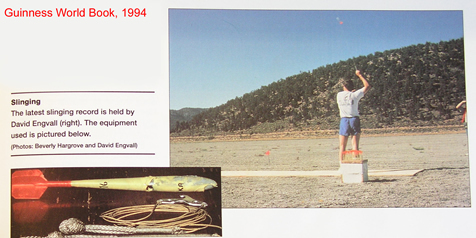 What I, personally, regard as the world's record for a sling, was set by Larry Bray on 1981 August 21st: 1434 feet, 2 inches (478 yards or 437.1 meters) with a rock weighing 1.8 ounces (52 grams). The sling was elk-hide and dacron cord, 51 inches (129.5 cm) in length. 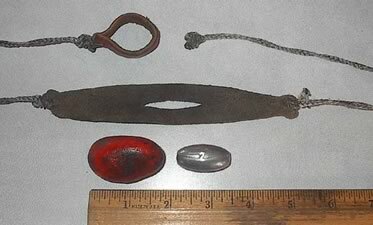 Here's a picture (from the gallery) of the sling and the rock, with a 2-ounce lead egg sinker (I think) and a ruler as reference objects. I think David Engvall's record should have been classified as something else. Engvall slung a dart; Bray slung a ROCK. So there. As for the rules, it seems to go something like this: you do something, and document (with witnesses) exactly what you did and how you did it. Send that to the Guinness people. They will decide whether they agree that what you did is remarkable, and where to fit it into the book. Bray had to do this, and so did Engvall. They agreed with Bray's definition of what a sling is, and also with Engvall's definition. So there. , claiming the record and telling how he did it, and posted it in the forum. The letter was 13 pages long. Unfortunately, only the first 4 pages of the letter are still available, but you get the flavor of what the Guinness people want. The dart really doesn't bug me as much as the fancy release hook he used. Truth be told, a dart doesn't even have an aero advantage over a nicely shaped glans. The big difference is that it is much easier to keep it oriented properly. I think the record deserves to stand within the limits set though. It is up to us to come up with our own requirements for validation. Personally, I wouldn't go as far as the Balears, for instance, who have annual distance competitions. And then follow up with this one, where everything suddenly becomes crystal clear... Different groups have widely different definitions of what it means to sling. I'm sorry that Vicente seems to have disappeared, he brought a lot to the discussion. Here's hoping he comes back to lurk every now and then. Alot can be lost in a less than perfect release, especially having only a few tries when going for a record. This is where a dart really shines.....in that it is easily preconfigured for a consistent release no matter the sling style or speed of the effort. The best of both worlds, as far a record attempt goes, as I am sure Matthias may be able to confirm, is to keep the fletching with the pocket such that the advantage provided by properly shaped lead ammo is ensured by the consistent orientation provided at release with a fletched pocket....enabling one to keep the nominal drag increase provided by the fletching......at home. I have attained my best repeatable distance performances in this manner. I agree, the record should be for throwing a non-flighted objetc witha traditional sling, eihter pocketed or split; in other words for slinging. In my view engval holds the record for throwing a dart using a piece of string - a hi-tech French Arrow. 1) Is the object being slung? Yes. 2) Is the object inert? Yes. There is certainly much room for an improvement on his record, if one is so inclined. However I personally feel about the "purity" of slinging and whether Engvall's record should be counted, his French Arrow or kestros or whatever is a very nice piece of work. There isn't a pocket, as such. The odd-shaped metal piece serves the function of a pocket: the hook in the middle slips into the hole in the side of the dart, the release cord attaches to the left side of the metal piece, the retained cord to the right side. When Engvall twirls it, the dart's own weight keeps it firmly attached to the hook, until he releases. Then the whole metal piece rotates, the hook slips out of the hole, and the dart is off and flying. It looks like the mechanism releases very cleanly, the dart won't have any sling-induced wobble. As for whether this is a sling -- well, the Guinness people read Engvall's thirteen pages of documentation, including his definitions of a sling ["a ligature throwing device (ie. a flexible extension of the human arm) that is powered exclusively by the throwing motion ... not an energy storing device such as an elastic slingshot"] and of a stone ["an inert (nonself-propelled) object"] and they accepted it. I must note that Engvall clearly pointed out his departures from the notion of a "traditional sling," including using kevlar and aluminum instead of leather, and using a dart instead of a stone. Engvall's point was that he had kept the essential features of the sling: two cords, one of which is released, and a device that holds the "stone" in place until he releases. Engvall also challenged anyone to better his record, and noted that his definitions leave room for innovation (rather than restricting everything to specific designs, materials, weights etc). Anyway, since Guinness publish the book, and not I, the record stands. I don't deem Engvall's record fit. And from here I suggest that all of us on this site agree to our own terms and conditions for a slinging record. Then we have a fair comparison to find skill from technical advantage and we can have our own record['s]. Sling: A pouch made from a material such as leather or string in which the projectile sits. At opposite sides of the pouch there is a cord fastened respectively. The other end of the first cord is attached to the throwers throwing hand. The other end of the second cord is held in the throwers throwing hand. Measurement from centre of pouch to the point on cord two that the thrower holds is no longer than one metre. What do you think so far. If someone would like to suggest some rules for the projectile it would be great and if anyone disagrees or wishes to expand on these terms feel free to post them. Larry Bray set the record for slinging a rock, David Engval set the record for slinging in what I would consider an unlimited class.